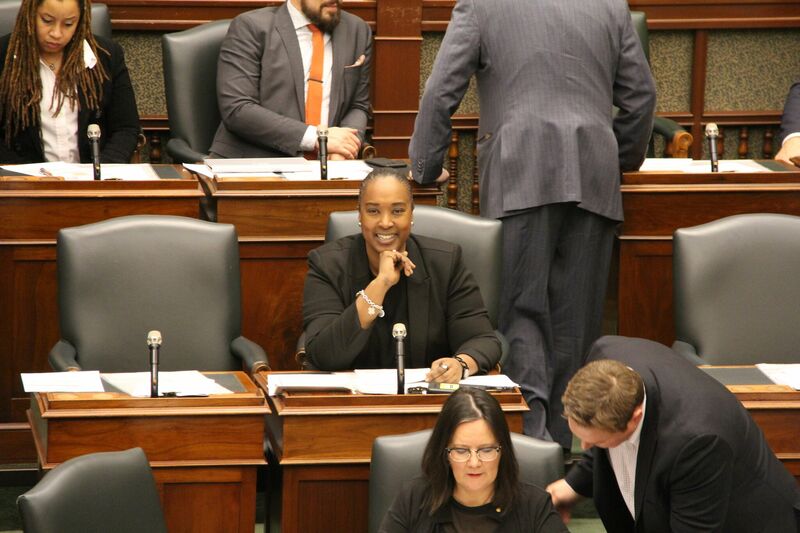 NDP MPP Jill Andrew at Queen's Park. Andrew’s story began when she was a curious and enthusiastic grade 10 student. “Throughout elementary school, I’d always been highly inspired and motivated by education and enjoyed the thrill of learning,” she says. “Luckily, this passion for learning followed me into high school.” That thrill first crystallized for her when she visited the Toronto Reference Library. “We had gone on a school trip and I was in awe by the size of this building and the sheer number of books. This building was there to help us learn and sift through new ideas. It was very cool and I felt like an adult that day,” she says. In 1998, after Andrew became a child and youth worker, she started her journey at York. As an undergrad, Andrew was further inspired by one of her instructors, a fellow black woman pursuing her PhD, who served as a role model for Andrew’s aspirations. “Even though she wasn’t a professor [yet], seeing her so passionate about our learning while pursuing her own doctoral education gave me permission to dream that such a reality could be mine,” she says. 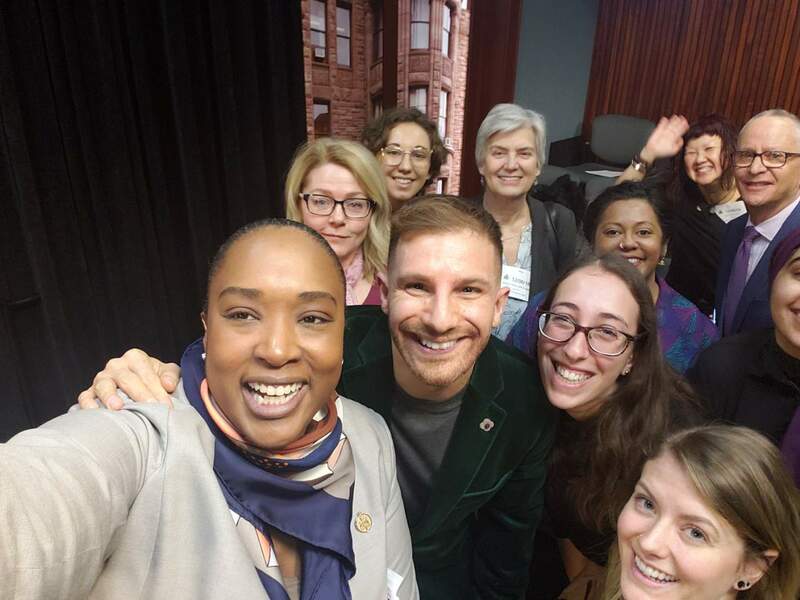 Through her education at York, Andrew became a high school teacher, a student equity program advisor with the Toronto District School Board (TDSB) and later a lecturer herself at colleges and universities. Also, as a community advocate, and someone who had personally experienced the sting of being bullied in school, she boldly took her activism outside the classroom and co-founded Body Confidence Canada (BCC), an organization combating body-based discrimination while celebrating body diversity. One of BCC’s biggest successes to date was the creation of Body Confidence Awareness Week, the second week of October, which is currently recognized across the TDSB and the Winnipeg School Division. “This week could not have happened without the critical support and leadership of school trustees at both boards who recognized the deep impact this week could have for kids and educators in the classroom and championed our vision,” Andrew says. In her newest role as an Ontario New Democrat MPP for the riding of Toronto-St. Paul’s and the Official Opposition’s Culture Critic on December 6 last year, Andrew debated the second reading of her first ever bill, Bill 61, a private member’s bill she introduced in the Legislative Assembly of Ontario (Queen’s Park). Bill 61 is intended to formally recognize Eating Disorders Awareness Week across Ontario. “This bill attempts to address some of the concerns of parents, guardians, educators, service providers and young people within my communities living in a looks and image saturated society,” she says. “Bill 61 also relates to many body-related issues my York thesis reflects upon in regards to size, race, gender and weight-based body discrimination. Bill 61 can play a role at both the community and institutional level.” She noted her bill received unanimous support across party lines and is now heading into the committee stage of its journey towards becoming an official law. Andrew continues her advocacy, appearing on Citytv’s Breakfast Television to discuss racism and body shaming. NDP MPP Jill Andrew poses for a selfie. For its part, York University welcomes students to become involved in one or more of the 449 student clubs and associations on campus. These associations specialize in academics, advocacy, charity, faith, politics, professional development and sports. Faculty of Education students are encouraged to engage with the Faculty of Education Students’ Association.